Tom Ford Noir Absolute For Eyes is what I wanted Cle de Peau's cream eyeliner to be: a smooth blue-tinged black with a superior texture (Cle de Peau was choppy and rough). 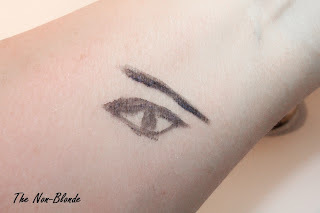 I swatched the eyeliner with a thick brush so you can see the full effect of the color and that even blue-shy people shouldn't be afraid of trying Tom Ford Noir Absolute. The blue particles are more subtle on the lid and have brightening effect more than an actual presence. The finish isn't glossy, making this liner a good choice for daytime. 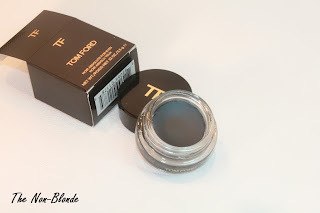 As far as the texture of Tom Ford Noir Absolute, I fully agree with Amy from Cafe Makeup: this liner is not as soft as Bobbi Brown or YSL gel liners. Thus, it requires the right brush- a wide and firm one that you can stick in the pot and go to town. Bobbi Brown's gel eyeliner brush is an option, and also Hakuhodo K005 type, especially if you tightline well into your upper lashes. Another way to get the most out of this liner is to scoop a tiny amount onto the back on your hand makeup artist-style and work it into the desired consistency, especially if you want to draw the thinnest line. The longevity of Tom Ford's liner is excellent. Maybe not as tenacious as YSL (nothing is), but it's still an all-day affair that doesn't budge in the rain. 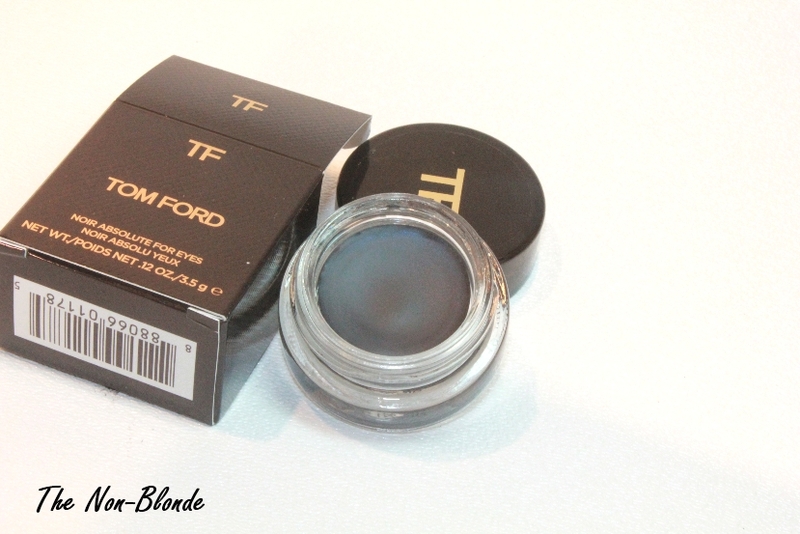 I'd say that the main advantage of Tom Ford Noir Absolute For Eyes is the superb color and easy to wear finish. I'd compare its performance to the beautiful Suqqu cream liners, though the latter come with an excellent brush that serves one long after the tiny pot is gone. Bottom Line: worth a visit to the counter. Tom Ford Noir Absolute For Eyes ($35) is available from Saks, Bergdorf Goodman and NEiman Marcus.